Rest. Play. Fun. Laughter. No School. It's Spring Break in the Academy! We are breaking out our beach shirts and lei's to celebrate the end of Winter and the start to a new season. We are looking forward to the sunshine and signs of new life around the Academy to remind us that God is making us new everyday. 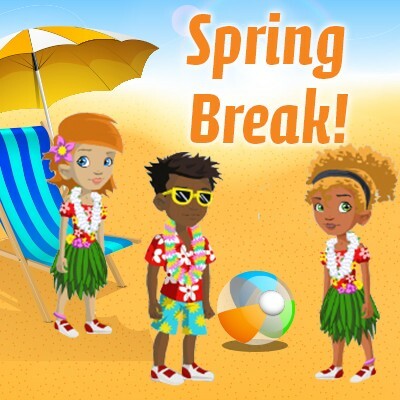 Do your Gliddle Challenges all this week to get your Spring Break outfit! Find the Moderator in the game and you'll receive cool sunglasses or a beautiful flower for your hair! Looking forward to hanging out with you all this Spring Break!